January 2018: We’re adding improvements at 24th & 27th Street to better serve Oaklanders who ride transit on Telegraph. Keep an eye out for our new bus boarding islands, scheduled for installation the week of January 8! January 27, 2017: We have some key before-and-after data to share. Read our Telegraph Progress Report to see how the project is doing. December 23, 2016: Telegraph Complete Streets is one of six projects in the US nominated by Streetsblog readers as the Best Street Transformation of 2016. December 19, 2016: Telegraph Complete Streets is one of ten projects recognized by People for Bikes as one of America's Best New Bike Lanes of 2016. May 10, 2016: Join us for a Ribbon Cutting Celebration & Media Event on May 10 from 9:00-9:30 a.m. on Telegraph at 21st Street (northbound side) with Mayor Libby Schaaf. April 2016: Pilot implementation concludes, including protected bike lanes, new parking configuration, and painted bulbouts. March 2016: The pilot implementation of the project begins with installation of lane lines and high visibility crosswalks from 29th Street to 17th Street as part of a citywide repaving project. 2015: Oakland successfully applies for funding to implement the Telegraph Avenue Complete Streets Plan with permanent treatments, and identifies an opportunity to implement a pilot version of the project through an upcoming citywide repaving project. 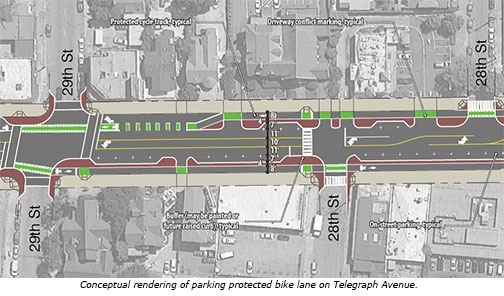 December 2014: Oakland City Council adopts Telegraph Avenue Complete Streets Plan. 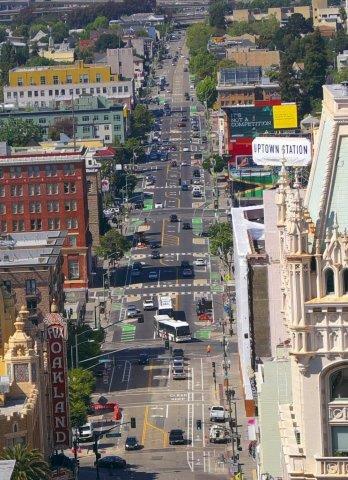 January 2014: Oakland begins Telegraph Complete Streets Plan effort. Prior efforts: Many planning efforts, including the 2005 Pedestrian Streetscape Improvement Project, have looked at improvements on Telegraph to better serve people biking, walking, taking transit, and driving. The goals of the Telegraph Avenue Complete Streets project are to improve safety and accessibility for all users, make the street more comfortable and enjoyable for people walking and biking, and balance the needs and convenience of all users. Your voter-approved transportation dollars funded this project! The recommended project will improve safety for all modes of travel on Telegraph Avenue through a combination of treatments that include bicycle lanes, new and improved pedestrian crossings, relocated bus stops, additional turn lanes, and traffic signal upgrades. Remove 1 travel lane on Telegraph Avenue in each direction between 19th Street and 41st Street to allow for the installation of bicycle and pedestrian safety improvements. Install parking-protected bicycle lanes (also known as “cycle tracks”) between 20th Street and 29th Street, using low-cost and interim materials (e.g., paint, striping, colored pavement, flex posts). Install buffered bicycle lanes between 29th Street and 41st Street, using low-cost and interim materials (e.g., paint, striping, colored pavement, flex posts). Install pedestrian improvements (e.g., median refuge islands, ladder crosswalks, curb extensions) using low-cost, interim materials. Reconfigure on-street parking, parking meters, and loading zones as needed to implement the proposed design, include potential designation of time-of-day loading zones. Relocate and consolidate bus stops to far-side locations to improve efficiency of bus transit operations. Construct permanent transit boarding islands at transit stops as funding is available. Prohibit on-street parking between 55th Street and Aileen Street under SR24 to connect existing Telegraph Avenue bicycle lanes to 55th Street and Shattuck Avenue bicycle routes. Evaluate the effectiveness of Phase 1 improvements to allow the City to seek funding for future capital improvements on Telegraph Avenue from 20th Street to 57th Street (e.g., curb relocations, stormwater management treatments). Seek funding for more focused design studies and community outreach on how best to reconfigure the street between 41st Street and 55th Street to become a complete street, including reconfiguration of the Telegraph Avenue/Shattuck Avenue intersection. The City solicited public feedback through an online survey from December 2013-January 2014. The City of Oakland presented draft Telegraph Avenue design options for feedback at three public open houses in late April and early May. The City of Oakland presented draft recommendations for Telegraph Avenue at two public hearings in September 2014. The Oakland Bicycle and Pedestrian Advisory Commission adopted the Plan recommendations in October 2014. Oakland City Council adopted the Plan recommendations in December 2014. Meeting #1 will present several alternative concepts for review and comment. Meeting #2 will present the final draft conceptual designs.